Bronco Wine Company today announced that wines under its Red Truck® brand will feature the innovative Helix packaging, the world’s first cork stopper and glass bottle with easy-to-open and reclose technology. Helix was developed by Amorim and O-I, the world leaders in cork and glass packaging. 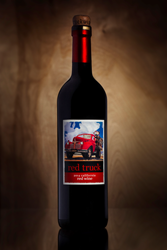 Bronco’s Red Truck® will be the first US wine to bring this innovation to American wine consumers. The new twist-to-open concept combines an ergonomically-designed stopper made from cork and a glass bottle with an internal thread in the neck, creating a high performing and sophisticated wine packaging solution. Helix combines all the benefits of cork and glass – quality, sustainability and premium image – with user-friendly, twist open, re-sealable convenience. The result of a collaborative R&D effort between Amorim and O-I, the development of Helix drew on both companies’ innovation capabilities and expertise in serving global wine markets. For many consumers, the ritual of uncorking the bottle, and the satisfying “pop” as the cork is released, are central to the wine occasion and an intrinsic part of the DNA of wine – borne out by the billions of corks and glass bottles used worldwide each year. Thanks to Helix, for the very first time consumers can enjoy this classic ritual, including the associated “pop,” without the need for a corkscrew in an easy-to-open and easy-to-reclose package. Founded in 1973 by Fred T., Joseph S. and John Franzia, Bronco Wine Company is a family-owned winery, the fifth largest winery and is the largest vineyard owner in the United States. Bronco Wine Company’s diverse family of brands is sold in over 90 countries in addition to being distributed throughout the US. Our quest for quality begins with the vineyard and continues to grow into areas such as premium bulk wine production, R&D, brand development and brand marketing, and national distribution. Bronco Wine Company is vertically integrated, from the vineyard to the table, focusing on crafting wines for the American table. Owens-Illinois, Inc. is the world's largest glass container manufacturer and preferred partner for many of the world's leading food and beverage brands. The Company had revenues of $6.2 billion in 2015 and employs 27,000 people at 80 plants in 23 countries. With global headquarters in Perrysburg, Ohio, O-I delivers safe, sustainable, pure, iconic, brand-building glass packaging to a growing global marketplace. For more information, visit o-i.com.